Baba Travels The Worlds of Anarchy Online From Ruby-Ka To The Other-Worlds. Baba is taking a break from AO currently. We purchased Guild Wars 2 and will participating in Beta events and playing when the game officially starts in August. 28, 2012. Just a few days ago Babacratus was level 103 and had started timidly exploring the path to Ergo in Elysium only to be totally intimidated by the 105 to 110+ level mobs guarding the approach. With just one dungeon run, a few Ely missions, and a couple of Rubi-Ka dailies and suddenly he is level 110. The really sweet part is that with hitting 110 he can finally self cast Muddle Psyche, a great Area of Effect Calm. AOE calms on one of the defining tricks of the Bureaucrat class. Baba is really looking forward to trying it out. He started his run to 110 with a nice run through the Sprinklecove static dungeon in north Central Ely. Starting at zero, he dinged a level before he reached the final Boss level. He really likes this dungeon. It has a minimum number of those Crat pet traps sections where there are a series of staircases. It also has quite a few really, really big rooms/areas which is always welcome. (Baba can get claustrophobia.) 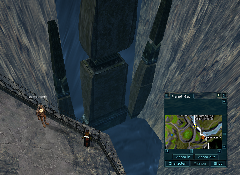 This dungeon can be hard to find so see our previous post on where it is. But not from the west bank. Next he ran a few quests in Ely. The first one was the quest given by guard Elmo Fitz at the base of the ramp at Port Seven. Kill 3 Devourers of Life and get practically a full level of experience based on your level in addition to the reward promised at the beginning by the NPC. Baba's Nube Tip: Don't skip this quest if you are looking to level quickly. The next quest he tried from the NPC "One Who Wins Over Mind" turned out to be quite simple, but he had read the online description is such a rush, that he went to the wrong location to look for the mushrooms he was tasked with collecting. The quest requires mushrooms that can be found quite close by, just a short ways slightly north east of the quest giver. Baba's Nube Tip: Just because there are no red mobs around, don't try doing it if you have just rezzed and are at less than full health. He did and almost died. Each mushroom is toxic and you get a pretty hefty poison hit as soon as you pick harvest them using the bag given to you. So definitely have stims/kits or get a nice Heal Over Time buff if you are really squishy. The next quest from the same NPC sounds easy to, deliver a letter. It is a two part delivery. Take the letter to one NPC, then go talk to a third on the other side of Ely. It has a 30 minute timer, so it is a really good idea to scout out the route to the two NPCs before starting. Baba's Nube Tip: Make sure you have your garden key and have saved in your Ely garden before starting. Getting to the first NPC involves crossing a bridge over some Hecklers which will from time to time, aggro you and climb out of the gorge and do you in. Save at garden, start the quest, get to the first NPC quickly and complete giving them the letter, and pow, there is a good chance a 180+ Heckler will send you quickly your last save in the garden. From there you can use a statue to quickly travel to a point close to the next quest NPC and finish it with tons of time to spare. Now it was time to get back to Rubi-Ka and run some daily missions. The first mission the alien Spaced Out mission, but unfortunately he got the cocoon version, which he could not complete since his cocoon terminator (a unique item) has vanished, but the game says he still has it so it won't give him a new one or let him buy another. He uses AO ItemAssistant, so he is absolutely sure I does not have this item on his person or in his bank. The only way out of the mission was to die, which was not a problem as he had remembered to save before the mission. Note: Funcom is aware of this issue and working on a resolution. In the meantime they recommend that players petition in game when it happens to have the items flag reset. So with a little time wasted, he proceeded to pull a regular daily, and got the "Extraction" mission for the first time. At first it was kind of a pain as it is in Omni territory and while he could fly there with ease, bringing along his top level 136 Droid (which he relies on Babaemphee and trader Tireen's buffs in order to cast), was problematic. It might have gone better if he had scouted the mission entrance first. As it was, in order to get low and close enough to make out the doors meant that his Droid would end up running around aggroing every Omni in sight, which meant if he stuck around his Droid would be toast and require a recast. He high-tailed it out of there by flying north east to the nearest player city to take a Bar whompa back to civilization. He called on Babaengy to team with him and fly out there first. Once Babaengy was there and situated safely on top of the mission building, he beacon warped Babacratus and his Droid safely there. Babaengy logged off to wait for Babacratus to run the mission as Babacratus was fairly confident he would not need any help. After one failed try, he completed the mission. The first time he failed it was because he made the mistake of drawing the Omni aggro first, rather than letting the NPC do it. Even though you can clear the place before getting the NPC to sign up, more Omni spawn, often with several in a room. So the object is to keep the Omni from killing the side switching NPC long enough for it to reach the exit. Baba's Nube Tip: The Extraction mission varies in difficulty based on the profession of the spawned NPC that wants to switch sides. 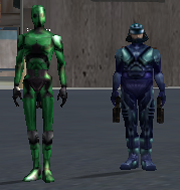 If it is a soldier of engineer, they are quite strong and able to defend themselves, while the other NPC professions that spawn are comparably weaker, so if you get an NPC that is not a soldier or engineer, simply exit the mission and then re-enter. This will spawn a new NPC as well as re-spawn all of the Omni personnel in the building. The Omni re-spawn can be a good thing, as they do give good experience. After finding the exit and the NPC that is a soldier or engineer, kill all the Omni personnel, then talk to the target NPC. Follow the NPC and hang back slightly. Let him acquire Omni aggro before sending your Droid in to help and casting any debuffs etc. yourself. Make sure you talk to the NPC when they stop just before the exit. Babacratus now mulling over what to do next. There are more options to level rather quickly now than compared to how it was for Babaoroody as a froob years ago on Rubi-Ka. You can now level so fast you out-level your gear and nanos quickly, meaning it becomes more important to budget time to work on bringing those up to par. Although Babacratus has stocked his player shop well, it has yet to make a dime, not a single sale, so perhaps he needs to drop prices as he needs income now, not top dollar later. The alternative, i.e. running dungeons or killing mobs in the wild for drops, is the ever inviting classic grind. With Shadowlands mid-levels have a ton of choices for leveling. At 110 he realized he at max level to get into Crypt of Home which is one of Rubi-Ka's classic dungeons which also features a couple of nice Crat pistols. After looking at the requirements, he realized they are something that will take serious twinking or many levels to be able to equip. Should he continue to take the fast track leveling to get to the next Shadowlands area Scheol, or take some time to farm for better gear in Ely and Rubi-Ka? After sleeping on it, he decided to stick with one simple plan, level, level, level. He has always been under-geared and it looks like that is just going to be the way it is for him for a long time. As the leader of Angels of the Night AO guild used to say "Get out there and level Nube." 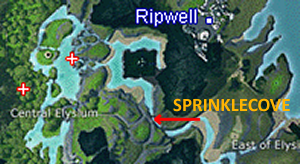 Sprinklecove is a dungeon in northern central Elysium. The mobs are remants (Cripplers, Kolaanae, Malahi, plus a few Mortiigs and Dryads) ranging in level from 95-105. It is a fairly large dungeon with lots of mobs and chests. Access is easy with only a couple of 95ish mobs guarding the entrance area. The exact location however is very easy to miss. Babacratus first read about Sprinkelcove at Jexia's AO website which provides Shadowlands hunting maps and nano lists. He also used AOVault's map as the basis for the map which he edited to show the dungeon entrance here. Here is the story of how Babacratus eventually found it. Babacratus has spent a good portion of his leveling time in Elysium in the Stormshelter dungeon. After hitting 100 however, the experience started to do down as the mobs there are 80-95 unredeemed. Baba has been using Jexia's AO website as a hunting guide, but when he started looking for the next higher dungeon, Sprinklecove which according to Jexia's site would have level 95-105 mobs, he could not find it. Jexia's map shows it to be just south of the big pyramid west of Ripwell. He made several trips to the area and eventually decided it must have been eliminated or one of the places not included in Rimor 2. He tried hunting level 90-105 mobs in the wild at places like the area south of Barter, and while the Mortiigs there gave good experience as well as making good charms, they also have excellent eyesight and are very social, so it is not unusual for pulls to go bad and emergency crowd control panic measures to not always work. While he as able to grab a level or two this way, it was slow as a bad pull could send him back to a garden and loose a good chunk of experience. Baba decided to look once more for the Sprinklecove. Arriving at the spot pointed out in Jexia's map, there is no dungeon door insight. The only thing nearby is a dam in a small river running south from the pyramid. From the west side, Baba peered down into the chasm and could see nothing down there except water and the bottom of the dam. He did notice there was two clues this time. There were guard fences along the lip of the chasm on both sides and a little ways south a foot bridge. He crossed the bridge and walked north. He again peered into the chasm, but could see nothing interesting. He next investigated a strange looking power house at the top of the hill which he hoped might be the entrance, but he found nothing there. He as about to start thinking about where to go next to hunt when he noticed that there was a spot on the east side of the chasm where there was no guard rail. Curious he walked over to it and peered down. No dungeon but he did spy a couple of 90ish mobs in the water. He jumped down to the water, which was a foot or so deep, and looking north up the chasm, he then saw the dungeon door at the base of a tower like structure behind the dam. On his first night there he dinged 105 after approximately 8 days of playing time as reported by the 'played' command. Babacratus joined Events By Jill, a clan org recently. He is really glad he applied. It seems to have mostly mature, easy going, and accomplished players. They have been really helpful and appear to be well organized. One of the first things he did was get some critique of his current Crat setup and general advice to work on getting symbiants. Crat symbiants, the 'Control Unit' class, happen to run into the 10-30 million each if bought from player shops. Baba is still researching which pocket bosses drop the symbiants. Babacratus spent some time going through his AO Inventory Assistant to find potentially valuable items to put into a player shop in the Events By Jill city. It took a few days to collect it all as the pieces were scattered over 5 alts and various bank toons. Eventually he stocked his shop and opened it up as "Babacratus Boutique". On opening day it featured an Instruction Disk Summon Grid Armor I, various buffing weapons, and a few dyna or mission only soldier or doctor nanos. How to Fish in AO? Baba was interviewed by a Clan org as a potential member recently. One of the comments made by the interviewer was along the lines of "we don't want to give out fish, but would rather teach new players how to fish." This is the crux of Baba's current situation. Babacratus is starting to realize his gear is in bad need of upgrading. The implants he put in back at level 60 and just not cutting it now. The deal with the expansions is basically this. You can get by up to level 100 with Rubi-Ka grade average gear and implants, but once you start in on 100+ SL mobs your old Rubi-Ka stuff just does not cut it. You need full symbiants, and at the minimum full Jobe armor. The path to the armor is pretty clear. He probably has all the insignias he needs, but 15 million credits total is a long way off. So far he has not made a profit at all, but has been draining down credits previously earned by his Froob predecessors that was farmed in Foremans or got by selling a few lucky mission drops like Grid Armor discs. etc. He has no clue as to how to get symbiants other than to buy them somehow, by farming something (?). He has only found complete patterns for one boss at this point, and it is for one that drops stuff that a Crat can't use. This is after killing hundreds of Ely mobs in the wild and dungeons. Last night he applied to an active clan org and was accepted for the usual 'trail period'. They were a friendly bunch of people and most welcoming. He got plenty of helpful advice, mostly regarding his need to get a full lvl 120 set of symbiants in order for him to be able to effectively use the crat tool-chest in Ely. He got to inspect several other toons near his level and could see how they can meet the requirements for level 120+ crat nanos of 800 or more in nano-skills by having the right gear. So it was instructive, but also a bit depressing, since he has no idea at this point exactly what to farm or 'how to fish.' Clearly what he has done in the past on Rubi-Ka as a froob is not sufficient. Some people, i.e. the ever shrinking core of end-gamers around, obviously never blinked on this issue and somehow solved the getting credits issue. Baba is convinced this issue is precisely why AO's player base continues to shrink. It has nothing to do with graphics, Look at on of the biggest hits around now, Minecraft. It makes AO's graphics look like a Hollywood production. Graphics is a non issue and at best will bring in a few curiosity seekers if it is ever released, but the grind to farm for gear essential to level and get teams remains and most likely will continue to discourage all but the few who somehow intuit or luck into a way to credit independence in AO. Ohtizz, a level 27 Froob Adventurer, was still groggy from coming out of extended suspended animation, and wondering who or what had prompted this recall. He had originally been brought to Ruby-Ka as one of Baba's earliest recruits. He had been through the starter Island and the Subway, but has been stalled at 27 for quite a while now. Rolling on the River from one of THE best live shows ever, Ike and Tina Turner doing "Proud Mary" nice and rough, from Amazon. Babaoroody explained to Babacratus that getting your profession specific mission only nanos is one of the early challenges on Ruby-Ka. To be useful the nanos must be at or somewhat above your current level which means completing the mission involved will be tough to impossible solo, but manageable if you can team with someone. Some of these nanos are deal makers/breakers in terms of how viable a low level profession may be, so it is easy to see how the whole obscure knowledge, having to roll and discard missions until you find what you need, and then getting help to complete the mission can be a pretty steep requirement for some new people. So Ohtizz was on Rolling Duty for a few Bureaucrat mission only nanos. It has to be one of the most boring activities on the planet. About the only thing positive he can think about it, other than the potential end rewards, is occasionally it can provide a nice 'quite' time if one is overloaded from too many manic activities like dungeon crawling, teaming or PVP. After about 30 minutes of trying to do it manually, i.e. push the request mission button, scan the 5 missions offered, and then scan the of the rewards or find items for things he needed. It was worth it to stop and spend 10 minutes to dust off and update a nifty inexpensive program called "MishBuddy" that does something wonderful. It pulls missions automatically and stops when it has pulled a mission that contains an item you have specified that you want. There is another mission pulling program called "ClickSaver" which Babaoroody has also used in the past which does basically the same type of thing. Babacratus simply likes the look and feel of MishBuddy. He won't recommend one over the other and tells friends to try them both and decide for themselves which to use. Power armor, personal micro nukes, dropships, space marines, and countless other Sci/Fi memes were introduced by Heinleins Starship Troopers a terrific read, from Amazon. Tonight Ohtizz was rolling for a nano that buffs the Crat and any team members, and pets, with a +5 offense and +35 defense. Babaoroody tells him that direct buffs to offense or defense are some of the most effective buffs there are. While he kept 'MishBuddy' pulling missions in the corner of his eye, he started re-reading a great space battle yarn "Starship Troopers" by Robert Heinlen. Eventually after spending around 10,000 credits, the program stopped and let out a little bell to let him know it had found the desired nano in a mission located in Stret West Bank near the Reet Retreat. He called Babaoroody in to assist. Since it was a kill a level 37 person and get the reward type of mission, Babaoroody could not simply do it for him, they would have to be teamed and Ohtizz would need to be present when the rub out happened. They teamed up, and Ohtizz set out on foot and Whompa to the mission which fortunately was a short walk from the Stret West Bank Whompa. Next Babaoroody took his Yalmaha to the nearest grid point, gridded to Borealis and then took the Borealis Whompa to Stret WB. He met up with Ohtizz outside the mission where Ohtizz used a mission key duplicator to make a duplicate mission key so Babaoroody could enter the mission. Once inside, Ohtizz waited in the first room while Babaoroody headed for the room furthest from the entrance where he found the missin objective level 37 mob, he put it down with about 1 and a half swipes of his 'Pained Panther'. Since Ohtizz was teamed and was in the mission area, the reward popped into his inventory. A little while later, he handed the nice new nano over to Babacratus. The next day Babacratus showed up at the Clan Mission Agency to get his daily Alien Mothership mission. This time he got the dreaded "Spaced Out" mission. He was quite frazzled by it. He first came to it after the comparatively easy leveling in the Core dungeons, where adds were few and random. At first this mission seems impossible, every time you kill an alien two more teleport in to alternating opposite corners! Then after your third alien kill, a mini-boss spawns in the center of the room, which if you attack there, will aggro all of the other aliens in the corners. After three failed attempts he deleted the mission the first time he got it. Babacratus then did his homework on the net, and found that people who were successful at this mission recommended being mindful of two things. The first is that the mobs always spawn in the opposite corners of any that you kill. For example if you kill a mob in the southwest corner, one mob will spawn in the northwest corner, and one in the southeast corner. They will not move unless you get close to them or aggro the final boss too close to them. The second thing is to body pull the boss after it appears back to an empty corner before attacking it. This allows you to fight it alone. As he had previously found taking on the final mini-boss with only his Droid somewhat iffy, he modified the tactic by charming one of the first pair instead of killing it. After charming one of the first spawns in the southwest corner, he moved to attack the alien in the northeast corner, and while his droid and charm fought it, he placed himself near the wall, and halfway to the northwest corner, as soon as the attacked mob died, he sat and recharged. He left the mob in the southeast corner alone. Next he sent the pets to attack the mob in the northwest corner. When it died, a alien spawned in the northeast corner and one in the southwest corner. Hugging the west wall and staying in about mid way between the corners, he sent his pets to attack the mob in the southwest corner. When that mob, the third alien to be attacked, dies, the mini-boss spawns in the center. Baba had made sure he placed himself against the wall as his pets were finishing off the third mob. He then ran along the wall to the northwest corner and called his pets to his side and gave them the command to wait. He then approached the boss slowly and as soon as he was targeted by the boss, he ran back to the corner, being sure NOT to shoot or attack it until it had run over to the corner. Once it was there it was safe to command his pets to attack and he started attacking himself. As soon as the Warden dropped he looted a strange clump from it, which Baba then gave to the female abductee after a brief conversation with her. After she had it, she and the other person ran to the center platform and Baba followed them, in a few seconds he was back on Ruby-Ka, and his reward back at the agency was another alien level and a new title "Common." The token reward brought his collection up to 30 which allowed him to level his token board up to the second level "Leaves of Spring" that provides +60 Health and +40 Nano. His next stop was going back to Nascense Wetlands to hunt Core Hecklers (lvl 80) solo. Thanks to work by Ohtizz and Babaoroody, he now had a nice off and def buff from the mission only Motivational Speech (Lead from the Front). This helped a great deal with the Hecklers, with the result being that when one did lose interest in his pets and come after him, Babacratus could survive a brief attack or two while losing minimal health. Previously a single swipe from these guys would take a third to half his health. Everything else went like his previous Core Heckler Hunts. Send in a short term charm pet first, followed soon after by his long term charm pet and his droid. He even learned to place himself so that when the first short term pet died, he could conveniently charm another and send it to a attack right away. He even worked out a little route based on the first three Hecklers found going clockwise from the bridge from the statue. By the time he had killed the third one, the first one would have re-spawned. He preferred this over continuing around the perimeter of the area, because there were plenty of Spinetooth Hatchlings around in this area to charm as needed whereas further around the Hecks were quite removed from the nearest Spinetooths. Once he gained a level from this to ding 70, he returned to Old Athens and after checking his new stats realized he could now pop in some level 100 store bought implants with ease. The main thing this did for him was to bring his Matter Metamorphosis closer to the requirement to equip Neleb's Nano-master robe which is his current back item objective. Babacratus recently went off on a fruitless tangent to Steps of Madness, did some exploring in Elysium and then got back to the business of leveling in Nascense. It started when asked his older siblings, Babaengy and Babaemphee to help him acquire a Neleb's Nano-Master Robe from Steps of Madness. The plan was, since Babacratus now had the stats at lvl 66 to equip said robe, that Babaengy and Babaemphee would fight their way in, and once there, Babaengy would Beacon Warp Babacratus in. They should have tested it first. Although both are at level 100, and all the mobs were gray to them, it was a slow slog in. Somewhat like the Temple of the Three Winds, there are lots of gray mobs packed closely together such that if you aggro too many at once, you will be toast. The layout is even more tight and cramped than TOTW and in several places the visibility is poor due to lighting and poor sight lines, especially at doors which typically open into rooms packed with mobs waiting to pounce on anyone foolish enough to just barge in. It gave team pets a chance to get back into practice and in spite of the frustration caused by the visibility and gray crowds of mobs, the run in took about 40 minutes. 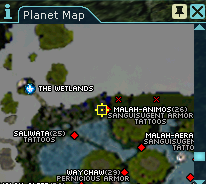 Once they made it to Neleb's area, they found a trio of 200+ players, camping Neleb. There were also 3 or four Neleb corpses laying around which Babaengy inspected and found they all had robes ready for the taking. Since they are no drop though, they would have to warp Babacratus in to pick one up. It was then that they discovered that the looking for team window will only display players within teaming range, which they had forgotten Babacratus was too low to team with them. Neither Babacratus or Babaengy could see each other in the looking for team window, which is the only way to team with someone that you cannot select by clicking on them in the vicinity. Beacon Warp only works with team members. There are several ways determine who you can team with. One is to use the command line and enter the command "/tell helpbot level" which will give you information about the level missions you can pull and which levels you can team with. Another method is to take the lowest level players level and multiply it by 1.4 to get the highest level they can team with. The highest level player can multiply thier level by .74 to get the lowest level they can team with. Somewhat dejected, team pets fought their way back out, returned to Newland, and logged off for the night. Babacratus then logged in and thought that the simplest thing to do would be to level up a few more levels to where he could team with team pets. 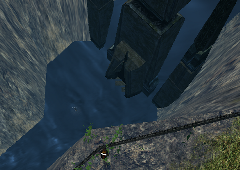 The next day, Babacratus did a little exploring of Elysium and tried to do some leveling from the base of the ramp at Port Seven to the spider hill past the Stormshelter dungeon. He gained one level, but did not adjust fast enough to how much more social these mobs are. They will come to the aid of another like mob from quite a distance. They will also aggro by proximity at a much longer distance than mobs on Nascense. He eventually took a quest from one of the ramp guards, and managed over a hour or so, to tippy toe around red mobs to within eyesight of the mission objective. At that point, on a sand bar next to the river, he was attacked by a giant eremite. He tried to run, that was fruitless and he was soon back at his last garden save point. He next thought about it some more and went back to the Aban Garden and used the transport pillar there to get to Garden of Enel. From there, using an insignia, he transported to Ripwell where he was able to then walk unmolested in the back of the mission place and complete it. The next mission step required him to go further south, but he quickly got swarmed by several red level Hiathilins and managed to elude one while his Driod killed the other, and then they finished off the other. These mobs are in the 70 to 80 range and are too high to charm. He then returned to the Nascence wetlands to try his hand at the level 80 Hecklers there. The problem he ran into there was that all the other mobs in the area seemed too low to be any aid against the Hecklers. At around 22 about all they do is serve as a meatshield for his Driod. Using this method he could just barely take down the first two Hecklers, going clockwise from the bridge, but later Hecklers are space closer together and it was impossible to pull just one. He discovered you cannot charm the mini bosses on the wetlands, but at least go some nice drops afterwards. He also tried charming a level 35 mob from the next area down, Core and it worked great until the charm wore off. At that point, he could not re-charm it, and it went running back to Core. There is a dungeon on wetlands, which will have higher mobs in it, but dungeon mobs cannot leave the dungeon, charmed or otherwise. The next day after pulling the ridiculously easy Alien daily mission "High Toxicity" which simply involved targeting 3 not so toxic plants and getting a new alien title, he returned to Core Wetlands. This time he approached the Hecklers with 2 charms and his Driod. The first thing he did was survey the island to find the highest charm-able mobs, which turned out to be level 25 Spinetooth Hatchlings, and long charmed that, then he located the closest Heckler to the bridge and then he short charmed a level 22 Spinetooth Hatchling. He sent the level 22 in to attack first and once it's health was starting to plummet, he sent in his other Spinetooth and his Droid. This worked really well, it tended to keep the Heckler's aggro, and often both the long term charm would survive as well as his Droid past killing the Heckler. The short term charm also proved useful to pull. If he sent it to attack a Heckler and it drew a social add, Baba would recall it using behind or follow. This allowed him to gain level 69. He is not quite sure why, but only the first Heckler would follow, which would bring it far enough away that Baba and his other pets could then attack without fear of other Heckler adds. While each Heckler was giving 20-22k in experience, it was a slow process, slower than leveling in the Core dungeons had been, due to the extra time involved in acquiring the level 25 Spinetooth, which all seemed to be located near the center of the Wetlands and then finding a Spinetooth close to the Heckler as the second short term spawn. The night before Baba had been somewhat dejected and resorted to doing some research on the NET forums where he at first found nothing related to how to deal with the Core Wetland Hecks. Eventually he gave up finding something that specific and settled for just reading general Bureaucrat charm information posts. While doing so, he came across the fact that he could charm at least two pets at his current level. The Crat has to use one long term and one short term charm. The short and long term classification matches with the most telling statistic which is long term pets have a 7001 code at Auno.org which indicates that no other long term pets can be active. The short term charms have a 7000 code which means that they can be done with 1 other pet active. With his ego and body still sore from the wipe handed to him by a swarm of Eremites in Elysium, Babacratus (level 60 Bureaucrat) decided to try something different from Shadowlands for a break, so he headed to Old Athens and the Clan Daily Mission Agency for some Alien mother ship missions. He met up with Babaemphee outside the Clan Mission Agency to pick up Mastery buffs to help him cast his best Drioid. After the agency teleporter sent him to the Unicorn base he found that it is enormous.He got lost several times before he found his intended ride. He spent a great deal of time just taking in base which offers a number of vendors and characters to interact with. As soon as he boarded the correct shuttle, he was inside the alien ship almost instantly. As his main intelligence for these missions had come from trader Tireen, he as very careful at first. She had run a few back when they were first introduced and at that time the Aliens could difficult for some levels. In preparation he also had scanned a great web guide to Alien missions at Anarchy Online Universe which gave him a good idea of how to proceed. He had no idea about the various types of Aliens he would face. He charmed the first one he came across which turned out to be a simple technician, which he soon found did little if any damage. He eventually found an Ensign, which he later realized, was the toughest alien he would meet in these dailies. After successfully clearing about half the mission of aliens using his charmed Ensign and his Droid, he found the mission objective, an alien technology artifact and put it in his backpack. He was pressed for time due to other commitments, so choose to exit the mission then. He later regretted this when he found that the mission reward was simply a few sided tokens. The only experience to be gained was from the mobs killed in the mission. The next day he pulled his second alien daily mission. This time after he located the artifact, he continued to clear as many aliens as he could find and eventually dinged his next alien level and class "Newcomer." When a fire was blocking his way to a portion of the ship he decided to try crossing it. He survived the crossing at half health, but soon found out that there was no other side, that the whole other side was on fire and he was back at his last save point in a flash. This turned out to be a boon, as when he returned to the mission, most of the mobs had re-spawned, allowing him to reap more alien experience. Babaoroody, was the next Baba to visit the Mission Agency, however as a froob he can only pull Ruby-Ka missions. At level 151, he has been getting the same mission "Eavesdropping". It is a devilishly awful mission. The objective is a high level Omni soldier with a fairly powerful gun. The problem for Babaoroody is that his usual equalizer tactic of kiting cannot be used in this situation. The Omni person is situated in a small enclosed area at the top of the high diving tower at Lush Hills resort. Not only is there not enough room in the enclosure to kite, but the ceiling is so low that Baba's vision is partially obscured. After failing it a number of times, he gave up trying to do it and simply cancelled the mission. Unfortunately an alternative never seemed to come up each time he requested a new mission. After telling Babaemphee (level 100) about this once when they happened to meet while helping prepare Babacratus for his Shadowlands efforts, she offered to assist. At first that seemed ludicrous to Babaoroody because she is 50 levels lower than him. Thinking it over more, he realized that in going solo with this mission, he had come quite close to winning several times. He had been just barely losing the race to lower the oppositions health. Babaente brought three pluses to the fight. The first was that her heal pet, while not strong enough to stay even with the Omni's damage, might be strong enough to at least enable Babaoroody to outlast the foe. The second plus was the additional damage provided by her attack pet. Lastly she brought additional damage with her dual skulls. The logistics of setting up the kills were time consuming. Getting to Lush Hills is always an out of the way trip of clanners. One thing Babaoroody noticed that had changed at Lush Hills since the last time he was there several years ago, is that there are almost no Omni guards to be found. There used to always be several, often within shooting range of the grid exit. Other than the mission target and a few lowbie mobs out around the perimeter, there was no one else around. After getting buffed up, the game plan was simple. Babaoroody would hit his Challenger, then a mongo, and then take the near instant ride to the top of the tower and rush the Omni. As he was firing off his alphas, Babaemphee took the lift up next, and proceeded to put the heal pet on the Enforcer, the attack pet on the Omni, and then ran herself up in the Omni's face to start wailing on it with her dual Skulls. The combination of the Enforcer's mongo, his serious Pained Panther damage, and the MP's much weaker but steady Skull damage, the Omni kept his aggro on the Enforcer. After all the time it took to travel there and set the attack up, the fight was over quickly. When the Omni hit the floor, Babaoroody was only down to about half health. It fit perfectly something Babaoroody had read in an ancient air combat warriors writings that describe combat as something like 'hours of extreme boredom punctuated by minutes of sheer terror." When Babaoroody got his reward later at the agency, he was just a few points short of dinging level 152. Babaoroody had always wanted to sponsor a toon with access to the Shadowlands, Alien Invasion, and Xan. He decided to take the plunge, filled out the necessary financial requirements, swiped his credit chit, and Babacratus, a nanomage Bureaucrat was born. Babaengy and Babaemphee were still level locked at 100 as they still need to get a second Custom Desert Reet pistol for Babaengy in Foreman's. Baba's loose plan at this point is for them to wait for Babacratus to reach 100, and then he will team with them to take on the Director. With only Babaemphee's Masteries buff, they are just not strong enough to take the Director when his Executive Protectors spawn. They have tried the director about 15 to 20 times and only once did the protectors not spawn, and that time Babaengy got his first CDR. Babacratus started on the Shuttleport Island rather than the Jobe Research backyard. The main reason he chose this was the island gives the option to earn a couple of Alien levels and once done with the Island, he could still go to the Jobe backyard to take advantage of what it has to offer. The starter Crat is pretty weak on the island compared to the experience of Baba's other alts there, but it was still loads of fun since he took advantage of Babaoroody's Shuttleport quick start guide to get the most out of the island. In just a few hours he had earned his starter armor, joined the clan, and acquired both a range meter and a pair of clan spectacles, two nice starter buffing items. Once he left the island, he met up with Babaoroody in Athens on the mainland. 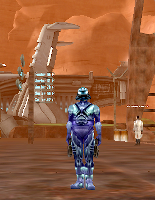 Babaoroody provided him with a stake of 2.5 million credits along with a personalized welcome basket that included: a Vagabond Cloak, 5 small backpacks, an Omni Med suit, some starter laddering implants, med packs and stims, and a few Electronicum and Old English pistols. After Babaoroody could not help but pass on a few tips, Babacratus made the long run over to Old Athens, the main Clan city, to use the Jobe Whompa. Once on Jobe he made the rounds of the three levels, gawking like a tourist and checking out the special vendors like the Jobe clusters vendor and the vendor that sells Electonicum pistols. He choose to use a Omni Med suite to replace his starter armor and it proved a wise decision. These were better than he had expected with a nice range of items and quality levels in stock. The only thing he found under-whelming was the global market terminals. Babaoroody the froob had long envisioned this providing endless numbers of nice armor, nanos and weapons for sale at decent prices, drawn from the hundreds of player shops that existed when he first started. Babacratus was surprised to find very few items available for sale. He proceeded to Jobe Research backyard where he quickly completed the starter quests, and outfitted himself with dual improved backyard weapons, the trade-skilled Chimera pistol. These pistols are a nice step up from the Shuttleport starter pistols, giving 5-20 damage with 15 crits at a firing rate of 1.5. Together with his driod, Babacratus has no problems facing any of the mobs on Jobe Research. When he reached level 20, he went down to Borealis on Ruby-Ka to get his first set of implants and to replace his med suit with some armor. For implants he was shooting to loosely follow Dredd's lowbie implant laddering method. After nudgeing Babaente, Babaemphee, Babaoroody, and Tireen to sift their banks for low end implants and buffing items he got started with NanoNanny, AOSkills, and the Auno.org implant designer. With his first set of implants in (ranged 30-55) he headed back to Jobe and entered Nascence for the first time. It was a large place to explore and most of the mobs were easy however twice when he was hunting weavers or strikers near the break in the frontier wall, a large boss spider took him by surprise wiped him and his droid out. After moving on to Hiathlins further north, he quickly leveled past 25, and had to run all the way over to Nascense Wilds where he spent time leveling off cripplers. After having to run almost all the way around the nearby Yuttos camp to escape from bad pulls, i.e. multiple cripplers, he soon learned to take the time to hunt and find cripplers who were far enough away from others so they could be attacked without drawing adds. Soon he moved over to Crippler Cave where he got his first teaming exercise with a group of other lowbies. This allowed them to easily take on all the mobs and mini-bosses there. About this time he also got his first charm, which made soloing much easier, but was a bit of a pain since lasted less than a minute. After he reached level 30 in cave, he returned to Borealis to upgrade his implants and trade his med suit for some Wiatt Cyber armor donated by the other Baba's, made possible by AO Item Assistant, which keeps track of their entire inventory in the background. Nexthe went to the Core area and leveled off the various mobs there till he reached around level 40. From there he traveled to the south tip of Nascense and some level 40+ Strikers. He was also able to get a better charm that lasted around 4 minutes which made life a lot less stressful. Next he moved to the dungeons in Core. Charming the level 50-60 mobs there made it easy to hunt the other dungeon mobs, however he learned the hard way something about the mobs found around the boss elevators. He has been able to pull singles away from groups in the dungeons using his taunt Ego Pummel quite successfully, however whenever he tried it on mobs in the boss elevator rooms, they all would respond, ending that outing and requiring another round trip to the save location and back. 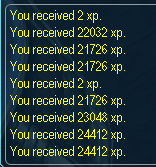 The drops were improving, with pearls being the most profitable, along with a pack or two of insignias for Elysium. The dungeon mobs gave very good XP and Babacratus was level 60 after only clearing 4 or 5 dungeons. Other than the group he ran into in Crippler Cave, he rarely ever saw other players in these dungeons or on Core. Once or twice he saw another solo player, but only in passing, never in contention for an area. After hitting 60 he returned to Ruby-Ka and brought his implants up to 65-75 levels, added a four slot belt and then headed out to the Temple of the Three Winds. By this time with the Mastery buff from Babaemphee, he could cast a Basic Assistant Droid (lvl 67) and had a 5+ minute charm. The temple seems to be entirely populated with a few new players like himself and many twinks, either solo or dual logged. Other than that, things have not changed there since Babaoroody used to spend time there. People still train Aztur as far to the front door as they can, and it is still too easy to get swarmed by gray mobs on the way in or out. Babacratus was pleasantly surprised at how durable the simple cultists were as charmed pets. He quickly traded up to grabbing Windcallers or other named mobs when he could. He was able to take Defender of Three with no problem and had his Notum splice on the first try. He spent a total of three nights there. He managed to loot a Guardian of Time's belt off a corpse, and eventually farmed a Exarch robe and a Notum ring off several Exarchs. He found that his droid and whatever he could charm were just barely able to take down Exarchs. With the combination of a regular pet (driod) and temporary additional ones (charms) plus roots and mezz nanos that are reliable, Babacratus glad he started out as a crat. He tried Gartua several times, winning once and losing twice. Gartua dropped nothing for him. While he had little problem getting access to the Exarchs, he found Lien pretty heavily camped all three nights. Staying late the last night, he waited until Lien was free, and came away with a free trip back to reclaim at least sparing him the painful exit via fighting through gray mobs to get out. Returning to Jobe, he visited Ergo and got his Insipid ring and made an exploratory trip over to Elysium, only to get wiped quickly by a swarm of giant eremites. He decided to stay in Nacense a while longer and is now planning to try out the Hecklers on Core next. Baba read this when he was starting out on Ruby-Ka. While it came out long before any expansions, it still covers basics like implants, skills, and city features. Written by the Anarchy Online game creators, this fiction piece provides the backstory of the central conflict in Anarchy Online between the Omni and Clan factions.